The value of safety - "The first Isofix Group 1-2-3 in the world"
European Car Safety Regulations ECE R44.04 approved. You can extend the usage of the Montecarlo R1 Car Seat when used with Jané’s Xtend Group 1 impact shield, a protective cushion that provides a safe and comfortable alternative to a harness. With the Xtend it can be used as a Group 1 car seat, effectively extending this Montecarlo R1 car seat, mainly a Group 2-3 car seat, into a Group 1-2-3 car seat, that's for children from 9 to 36 kg, or 9 months to 12 years approx. Montecarlo R1 is independently tested and approved under new European Car Safety Regulations ECE R44.04. This excellent seat was also subjected to the strict EUROTEST exam, which tests the safety and resistance of all the child safety seats on the market. It received one of the best scores on the market in its category, and an “excellent mark” with special mention made of its “safety in side crashes” and the “stability of the seat”. Install the Montecarlo R1 car seat and Xtend impact shield directly with the vehicle 3-point seat belt and optionally the car seat can be secured with the Isofix anchors for extra safety and stability. 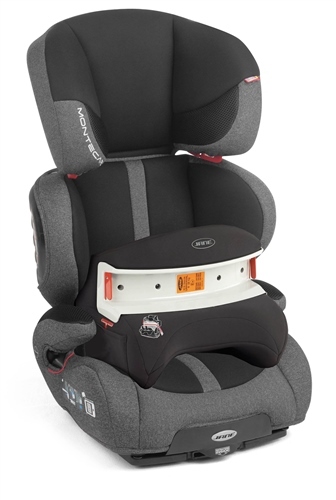 The child is held secure with the Xtend impact shield and the vehicle 3-point seat belt. Once your child reaches 15kg (approx. 3 years) you can disregard the Xtend impact shield and use the Montecarlo R1 car seat with the adult 3 point seat belt until 36kg / 12 years approx. Xtend impact shield for Group 1 - for children between 9-18 kg (20-40lb) / 9 months - 4 years. The car seat was delivered promptly. The seat itself is great and relatively narrow so can fit into the back of the car with two other car seats, but the Xtend addition is not a very nice thing though I understand it improves safety. I'm delighted with our third montecarlo seat. They are so well made, great design and good support and padding. Isofix and the xtend are great bonuses. Thank you so much for such a great service.